The Karelian Bear Dog originated in northwestern Europe. It was originally a hunting dog used by Russian and Finnish peasants. The Komi dog is considered to be the ancestor of the breed, and the original dogs were red, red-gray or black and white in color. The breed was further developed in Finland, and the black and white dogs were preferred for breeding. It was bred to be a silent hunter of large game, barking only when the game was stopped or treed. The first standard was established in 1945, and today the Karelian Bear Dog is one of the most common dog breeds in Finland. The Karelian Bear Dog was recognized by the United Kennel Club in 1996. The Karelian Bear Dog is a medium-sized, sturdily-built, Spitz-type dog, with a triangular-shaped head, prick ears, and a harsh, straight, black or black and white coat that is of medium length. The length of body, from point of buttocks to point of sternum, is just slightly longer than the height, measured at the withers. Slightly longer coat on the thighs may make the length of body appear greater. The tail is carried in a loose curl over the back, although a natural bob or stub tail is acceptable. Honorable scars or other evidences of injury resulting from working in the field are not to be penalized. The Karelian Bear Dog has a reserved but stable temperament and is very devoted to its master. Karelians have strong hunting instincts. They are normally aggressive with other dogs, particularly in their own territory, so they do not work well in a pack. They are fearless and self confident, and will attack bear and other large game without hesitation. Their senses, particularly the sense of smell, are very keen. They are never aggressive towards people. The head is triangular in shape when viewed from the front. The skull is broadest between the ears, tapering in width towards the eyes. In profile, it is slightly rounded. In length and depth, the skull measures approximately the same as its width between the ears. The frontal furrow is barely visible and the superciliary ridges are only slightly developed. The stop is not pronounced; rather it is long and gradually sloping. The muzzle is deep, and tapers in width only slightly from the eyes to the nose. It is about two-thirds the length of the skull. The nasal bridge is straight and the lips are rather thin and tight. The Karelian Bear Dog has a complete set of good-sized, evenly spaced, white teeth meeting in a scissors bite. Broken teeth resulting from field work are not to be penalized. The nose is large and solid black. In profile, the nose is on the same line as the top of the muzzle and extends just slightly beyond the forepart of the muzzle. The eyes are relatively small and oval in shape with an alert, sometimes fiery expression. Color is brown of varying shades. Eye rims are dark. The ears are strongly erect, of medium size, triangular in shape, and set rather high at the outer edge of the skull. The ears are slightly rounded at the tips and wide at the base. Faults: Long, narrow ear; pointed tips; ears placed too high or too far apart; soft ears that fail to remain completely erect when the dog is moving. Disqualifications: Drop ear, ears with bent tips. The neck is of moderate length, muscular, arched and covered with thick hair. Faults: Loose skin; insufficient coat on the neck. The shoulders are well laid back, with good angulation and well-developed muscles. The shoulder blade and the upper arm are roughly equal in length. The upper arm lies close to the ribs with the elbow close to the body and placed on a vertical line drawn from the highest point of the shoulder blade. The forelegs are straight and muscular, with strong bone and medium length, slightly sloping pasterns. The length of the foreleg from elbow to ground is approximately one-half the height at the withers. Faults: Straight shoulders; elbows out; legs too short; fine bone; down in pasterns. 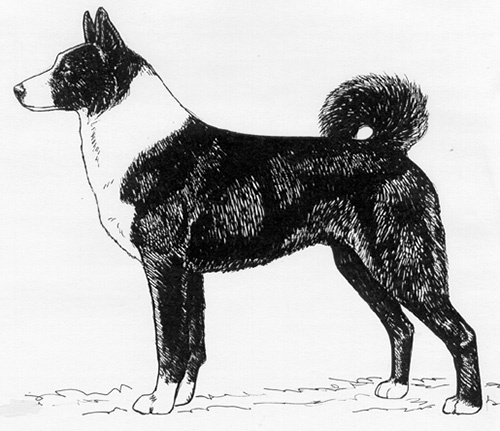 The Karelian Bear Dog is just slightly longer, measured from prosternum to point of buttocks, than tall, measured from the withers to the ground. The line of the back inclines very slightly downward from well-developed withers and then becomes level. The back is well-muscled, with a short, muscular loin, and a broad, strong, slightly sloping croup. The ribs are moderately sprung out from the spine, forming a strong back. The chest is moderately wide and the brisket extends to the elbow. The forechest should extend in a shallow oval shape in front of the forelegs, but the sternum should not be excessively pointed. There is a slight but noticeable tuck-up. Faults: Chest too deep or too narrow; barrel-shaped body; pronounced tuck-up. The hindquarters are strong and muscular, with the legs straight and parallel when viewed from behind. The upper thigh is broad, long and well muscled. There is moderate angulation at the stifle. The lower thigh is long and muscular. The hock joint is low, with clearly visible angulation. Rear pasterns are short, strong and vertical. Faults: Insufficient angulation at stifle or hock; cow hocks. The feet are of medium size, round in shape, well-knuckled up, with thick strong pads that are well covered with dense hair on the sides. The hind feet are somewhat longer and flatter than the front feet. Nails should be hard. Dewclaws may be removed. Faults: Splayed toes; thin pads. The medium length, high set tail is carried curved over the back, with the tip touching the back or either side of the body. A natural bob tail is permitted. The Karelian Bear Dog has a double coat of medium length, with the hair on the neck, back and buttocks slightly longer, and the hair on the head, legs, and ears slightly shorter. The outer coat is coarse, straight, and stands somewhat away from the body. The undercoat is thick, soft, and dense. Faults: Curly or wavy coat; lack of undercoat. Black, usually with sharp-edged white patches or marks on the head, neck, chest, belly, and legs. Brownish-black, matte black, and shiny black are all acceptable. Faults: White with black patches or wolf colored patches or spots. Disqualifications: Any colors other than those allowed in the standard. Desirable height, measured at the withers, ranges from 21¼ to 23½ inches for males, and 19¼ to 21¼ inches for females. The Karelian Bear Dog should be presented in hard, muscular condition. 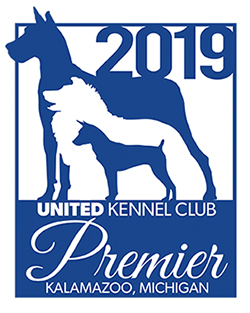 Serious Faults: Dogs over or under standard height should be severely penalized. The Karelian Bear Dog moves with strides of moderate length with a gait that conveys stamina and agility rather than power and strength. It is a quick, agile trot that enables the dog to switch effortlessly to a gallop, which is the breed’s more natural gait. Correct movement is essential in this breed. Any color other than those allowed in the standard. Drop ears or ears with bent tips. Karelian Bear Dogs are not to be penalized for dog aggression as it is a normal characteristic of this breed. Handlers, however, may be penalized for failure to properly control their dogs.